Jack’s disquiet had grown to panic, but he still got his shot. He’d been a photographer in Washington for too long perhaps. He did not think it was possible, but America had failed to see through the demagoguery. He’d walked with the new president’s car for a while — trying to get the best shot — but he couldn’t take it anymore. 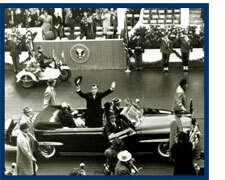 He let the car drive by, with Joseph McCarthy in the back, waving. Just two years earlier, army attorney Joseph Welch had asked McCarthy through tears: “Until this moment, senator, I think I never really gauged your cruelty or your recklessness. Let us not assassinate this lad further, senator. You have done enough. Have you no sense of decency, sir? At long last, have you no sense of decency?” The crowded hearing room had burst into spontaneous applause. Jack had thought it would be all over then. But then something happened. A real spy surfaced. And McCarthy had been right about at least one of his victims. The doubts about McCarthy turned to enthusiasm. The Senate did not chastise him, and in a one-sided vote they gave him more powers. The next year, Dwight D. Eisenhower claimed that he would not run again, due to ill health, but everyone within the Beltway knew the score — even those few Republicans who still didn’t trust McCarthy would support him. More high-ranking bureaucrats and armed forces personnel were named each day. Those who did not support McCarthy ended up appearing before his hearing. The car bearing his new President rolled down the road, was obscured by exhaust steam, and Jack wondered if America had disappeared with it. He took one last photo, just in case.